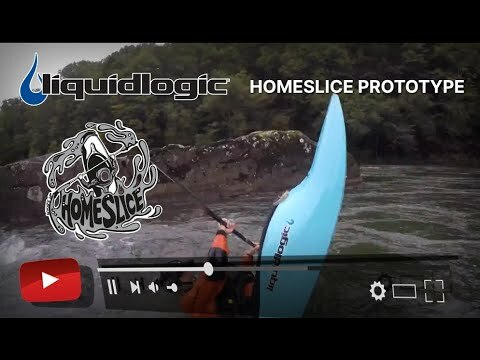 The Homeslice takes the win for best whitewater boat at Paddlesports Retailer 2018! What is the purpose of this type of design? The Homeslice is a throw back to the late 90s and early 2000s when high performance playboats were longer and slicier. The performance that is longer slicier design gets you is more stable squirting and cartwheeling because of the longer ends or wings traveling through the water. The longer length also gives you more speed to catch waves on the fly or to just surf waves that short boats can't catch. The other nice thing about the longer design is that it paddles like a kayak instead of a stubby cork like short playboats of today. Why buy a Homeslice when there are other older and newer boats that are kind of similar in design? For starters the Homeslice is much more comfortable. It was made to be slicey like older designs but it was also made to be comfortable. The knees are positioned in a more ergonomic high and more narrow position than other boats. That helps with hip and knee discomfort. It also brings your feet further back in the boat which adds more room so most folks will be able to wear shoes. There are also a few performance differences. We have learned a lot about hull design since the older boats. The Homeslice has our latest hull design that is much easier to paddle, looser, and has a slight V hull that makes the boat carve quickly edge to edge and loose for spins and blunts. The rocker profile is also adjusted from older designs so that it wants to cartwheel and stall easily. Why didn't you make more sizes? The reason we didn't make multiple sizes is that this medium size really does fit a wide range of paddlers. We have had team and factory folks testing the boat from 140 lbs to 220 lbs and everyone loves it. We also know that there are a lot of smaller sized slicey boats that smaller sized folks can fit in comfortably on the market.